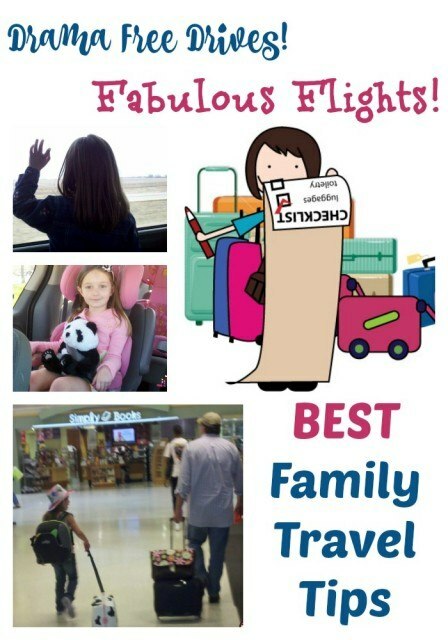 The best family travel tips & tricks, all in one place. Should you fly or drive? Tips to help you decide. Wondering about luggage? These are the bags we use and love. Sometimes travel problems can’t be avoided. Tips to help you deal with travel problems. Should you buy travel insurance for your family vacation? Tips to help you decide. If your child is under 2 years old and the flight is more than 2 hours long buy your child a seat and bring the car seat with you. Yes, it will cost more but a long flight with a fidgety child on your lap is no fun at all. And the car seat is familiar. You child is more likely to relax and fall asleep in their car seat than in the plane seat. For children over 2 years old and under 12 I recommend the CARES Aviation Restraint System for safety. Pay more for the direct flight. If you have a long layover many airports have play areas. Pack quiet play activities, packaged snacks and books – and each child has their own small carry-on. If they are old enough (ie: walking) have them carry it. Ship items to avoid too many checked bags. Even if your flight is short don’t forget the carry on! Delayed/ cancelled flight? Tips to get you back in the air quickly. Some of our favorite products for flying with kids. Space Bags or Packing Cubes – packing tips for your flight. Trunki Ride On Suitcase – great for getting through the airport quickly! Trayblecloth – provides a clean tray surface. Also has a clear, wipe off drawing/game area and pockets for organization. Tika Kids Activity Bag – this keeps crayons, markers, coloring books and other fun activities together. Snack & Play Travel Tray – this is helpful if your child is in a car seat as the tray table won’t lay flat for them to draw or eat. Check my product reviews for other great travel items. Plan fun stops along your route. Small town parks for snacks or a picnic, water towers in fun shapes, the world’s largest truck stop… Any excuse to get out of the car for a few minutes will keep boredom at bay. Join AAA. Not only can they help with car trouble but their TripTik travel planner can help you plan your route, locate gas stations, hotels and restaurants and lead you to some interesting spots along the way. Plan ahead. Prepare for naps, snacks, and any overnight stays. Get your kids their own atlas and let them follow your route. Really want a drama free drive? Consider riding the Mega Bus with the family! Snack & Play Travel Tray – keeps crayons and snacks from escaping. Great for drawing and playing with small items. Tika Kids Activity Bag – keeps crayons, markers, books and other items together. Love the optional magnetic board for games. Space Bags – I rarely pack without them. If you are renting a car I have some tips. Some of these are specific to foreign rental, but others are helpful anywhere. I’ve tested lots of great products, many are great for long drives. Have a travel question? Contact me and I’ll make sure you get an answer! Don’t miss a post! Subscribe to Family Rambling Inbox!